Published by the American Bar Association (ABA), The 116: The True Story of Abraham Lincoln's Lost Guard is the definitive account of the Frontier Guards who defended President Lincoln from a kidnapping and assassination plot in the opening days of the Civil War. Based on original sources discovered at the Library of Congress, The 116 delves into the lives of these 116 men and their charismatic leader – Kansas “free state” advocate and lawyer Jim Lane. The 116 valued experience and common sense over credentials; they were fighters, and the rebels wanted no part of them. Some were also idealists, eager to merge themselves into a group fighting for a cause. They had been kicked around by hard times on the Kansas plains, and had the scars to show for it. They were self-reliant, accustomed to hard work. They stood alone, together, to defend Abe Lincoln. These ordinary Kansans had a profound impact on our young country. They had learned from battling the proslavery men in the Kansas Territory that there could be no tolerance of the evil of slavery. Though the Jayhawks – as they were nicknamed at the time – were small in number, they were veterans of the sort of fighting that lay before them in the Civil War. And they knew they could not look to others for help; they had to defend Lincoln themselves. They risked their lives because of their loyalty and sense of rightness. The 116 paints a provocative portrait of the ‘civil war' between Free-State and Pro-Slavery forces that tore Missouri and the Kansas Territory apart in the 1850s, and provides a vivid portrayal of the battles pertaining to the protection and abolition of slavery that riled Congress on both a federal and state level, eventually leading to the eruption of war in 1861. 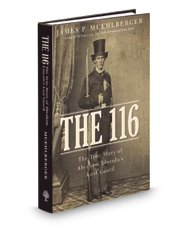 For Civil War buffs or anyone fascinated by the rich and violent tapestry of this particular era of United States history, The 116 is an exhilarating account of a little known chapter, painted on a canvas as broad as the Kansas prairie.